Prior to enrolling in a Project Lead The Way (PLTW) Introduction to Engineering (IED) class as a junior at Butler High School in Butler, Missouri, Jeremy Shaffer often struggled with his schoolwork despite working hard and getting plenty of help. That class changed Jeremy’s direction. He started working with Autodesk’s Inventor software and before long, he began finishing assignments early, helping the other students, and experimenting on his own. “From that moment on,” Jeremy’s teacher, Neta Apple, said, “Jeremy had a different attitude about himself and his future.” He joined the school’s Technology Student Association (TSA) chapter, who elected Jeremy vice president last year. When a slot at the Missouri State VEX Robotics Championship opened up at the last minute, they jumped at the opportunity to compete at that level. All 450 Butler students lined up around the gym to give the team high-fives. The team’s day at the state championship didn’t go very well, but they had so much fun and learned so much that it hardly mattered. 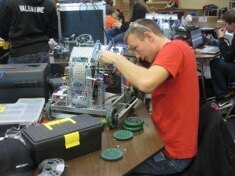 Through participation in PLTW, TSA, and VEX, Jeremy became a leader known for his determination and capabilities. “He has found out he can do things he never dreamed,” said Mrs. Apple. After graduating, Jeremy continued to work on the family farm over the summer. He attended FFA leadership training camp and has continued to help out with his former team.